So far, we've only been able to play BioWare's upcoming MMO in restricted and supervised environments. Well this week the blast doors have been blown open, the tractor beam has been powered down, and we've been exploring the galaxy in the new beta to uncover everything we can learn about the game. Today we're bringing you a look at the starting experiences for the Republic faction. Players on the Republic side choose from four classes, each of which is assigned to one of two starting planets. The Jedi Knight and Jedi Consular each begin as Padawans on the ancient Jedi homeworld of Tython, while the Smuggler and Trooper classes each find themselves stuck in the midst of a civil war on Ord Mantell. Each of the stories, particularly the smuggler's, begins with a hook that gets you right into the action, helping you understand not only who your character is, but also the larger context of the world around you. BioWare's promised to bring meaningful storytelling to the MMO genre and, based on the starting planets at least, that promise has been fulfilled. For one thing, all the content on the starting planets revolves around a single theme. On Tython, it's the appearance of a strange group of hostile aliens. On Ord Mantell, it's the war between the Separatists and the Republic. Every single quest bears some relation to the larger story and even the smaller side chapters where you're helping Twi'Lek pilgrims or Republic refugees fit the overall context of each world. It's a great way to keep the players focused on a single purpose for the first ten levels of play. Each character also experiences the game from a unique perspective. Though you're running through the same areas, fighting the same sorts of enemies, the Smuggler's experience of the civil war is very different from the Trooper's. The Smuggler's story kicks off when his ship is stolen, so all his interactions with Republic officials, refugees and Separatists revolve around trying to get the ship back and taking revenge on the person who stole it. The Trooper is very different. He or she has been sent to the planet to help put down the Separatists and experiences the content through a different lens. What makes it work is that BioWare explores the drama through the stories of individuals and relates it all to your character's motivations. For instance, at one point my smuggler was sent to rescue a boy who had been taken captive by the Separatists and, while the plot details are interesting by themselves, I was even more impressed by all that the mission accomplishes. First, it advances the overall narrative of the war between the Separatists and the Republic. Second, it tells you what the Separatists are all about. Finally, it allows your character to respond to the situation in a way that expresses your own values. Do you help the kid? Do you force him to do what you think is the right thing? Do you even tell his parents he's alive? There are lots of examples of this in each character's story, from deciding whether or not to expose a pair of Jedi lovers, or pondering whether to destroy a shipment of weapons or hand them over to a group of threatened people. 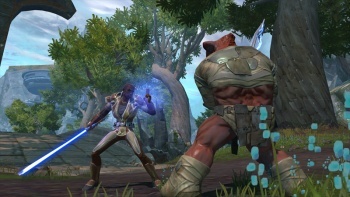 BioWare's storytelling in The Old Republic follows the same format as its other RPGs. In other words, all the story is delivered through talking heads and cutscenes. While it's an effective and familiar approach, I hope that the game begins to reveal more of the story through the actual gameplay and environments. It's true that the settings themselves provide a mood that helps support the overall tone of the story, but for the most part, the story bits are still stuck in the conversations. On the plus side, the dialogue and acting are top notch, and the range of responses your character can give definitely help you get in a roleplaying frame of mind.